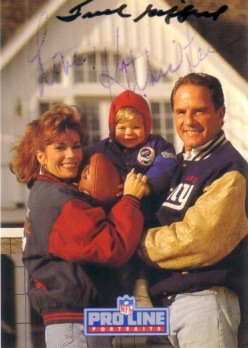 1992 Pro Line Portraits card autographed by Frank Gifford in black marker and his equally famous wife Kathie Lee Gifford in blue ballpoint (light). ONLY ONE AVAILABLE FOR SALE. With certificate of authenticity from AutographsForSale.com.